You can just see the seam lines above. I have some mint coloured lycra and thought I'd make some 'piping' but in the end I didn't have enough time. My last spotty rashie (did I even show that one? or take a photo of it even? Now it's faded and nearly dead). I always put bands on the sleeves and on the waist of the shorter one but the hem on this one was just done on the coverstitch. I put a band on the pants too. Just sewed up with zig zag and as I couldn't find my rubber elastic I just used some I got at Aldi. The key to the elastic if it's the covered stuff, is that it shouldn't narrow when you stretch it. This was nice quality and the right width. 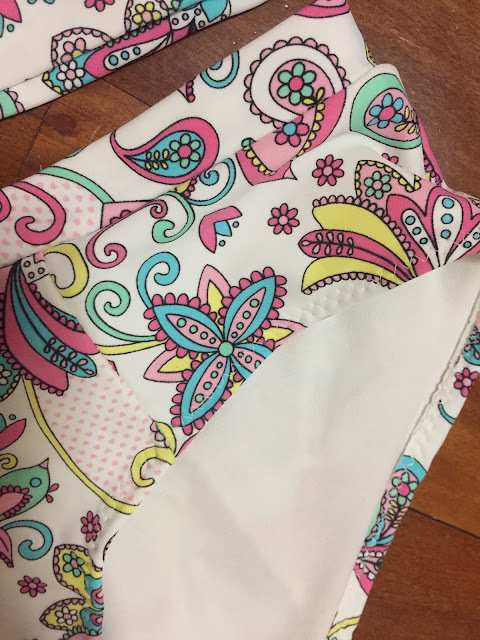 When I cut the band, I put elastic in the middle of the band and sew it on, then fold the band and sew it on the pants (with the overlocker) with the zig zag stitch facing the inside. This keeps the waist band firm and secure. 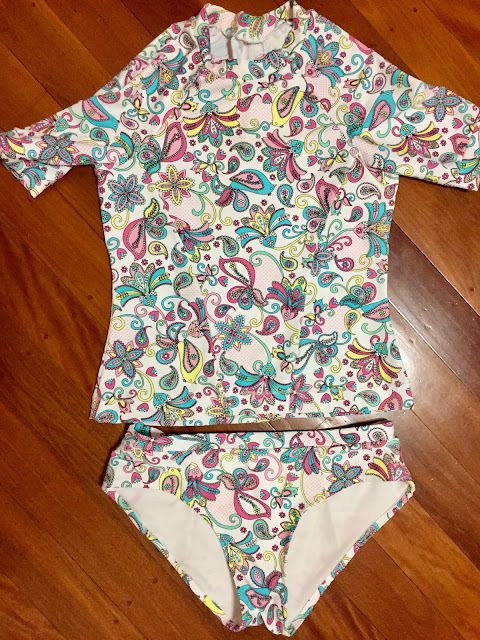 I made the size medium and the top is a bit wide at the hips (that's new!) and the pants are also not as firm fitting as I'd like but they are good overall. I do admit that I feel like I'm wearing pyjamas due to the print/colour but I do like the set a lot... perfect for aqua aerobics with a sports bra on. Also I get sick of trying to put the sunscreen on my back! I also made up a little zip purse for a friend's sister. This was promised 12 months ago. This narrow piece was leftover from a cushion cover said friend asked me to make for her sister for Christmas last year. This scrap was left over and I said I'd make something up with the scrap. I was looking for something else (still not found - leather prepped for a gift for another friend) and I found this so whipped it up. It's not perfect as the fabric was so twisted up and skewed (the whole piece my friend bought was printed off grain - I would have returned it... well, I probably wouldn't have bought it actually - due to skew and I'm not a Dr Who fan). The lining is from a dress I made about 10 years ago and the last tiny scrap made a secret surprise pocket! I know my friend's sister will love this even though it's not perfect.I've got some Christmas things I'd like to make but not sure how much I'll get done. 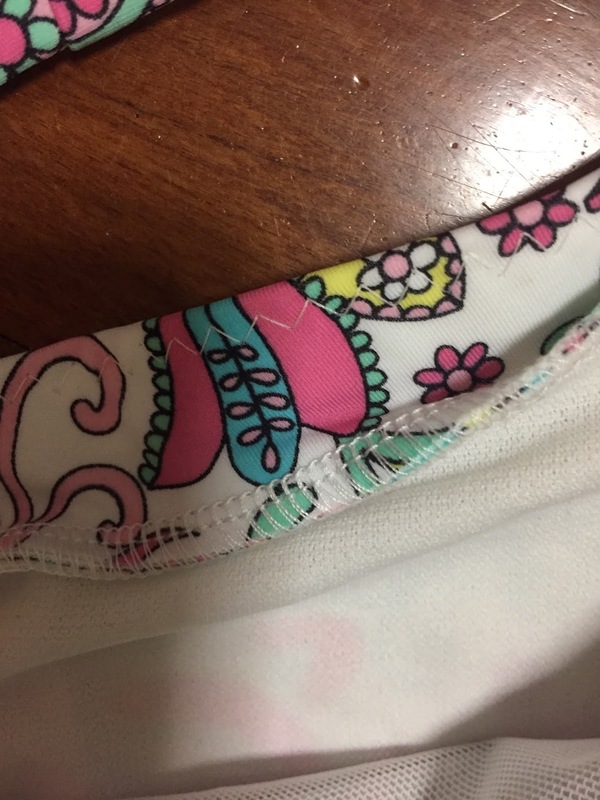 Anyone doing Christmas sewing? What are you making? How sun protective are the lycras? I wish I had one but I know I swim or would need it so rarely it would just die in between the first wear and the second. sigh. Not sure. I put sunscreen on under anyway. They are not SPF rated... just for looks me thinks. You can buy SPF lycra but not easily. Great swim set. 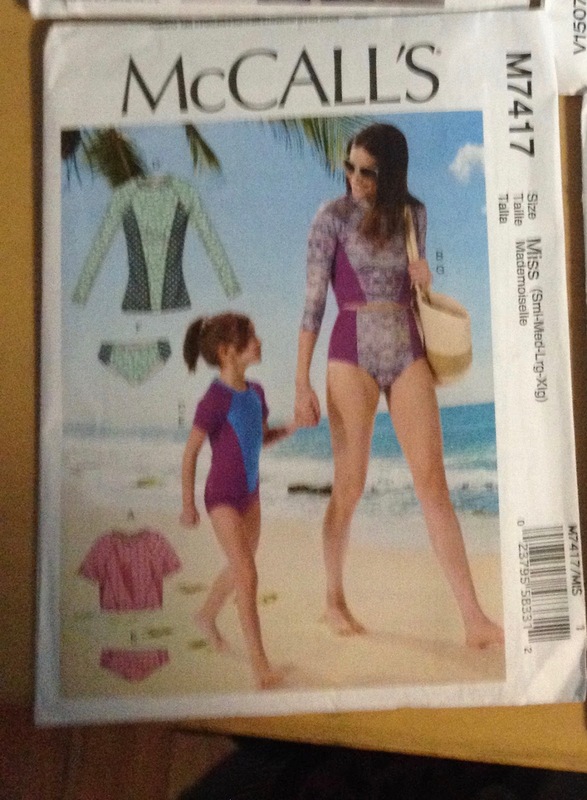 I bought this rashie pattern in a recent spotlight sale but I won't have time to get to it before xmas - too many other things started to finish off!! Yes, so much to do. It's a good pattern actually. I forgot to say I fully line the pants. The swim set is really cute!!! For Christmas, I am sewing a zippered infinity scarf! I saw a tutorial on P4P's site, and it is adorable. Somehow the thought of stashing goodies in my scarf is appealing!